This species is accepted, and its native range is Lesser Sunda Islands to New Caledonia and Australia. Leaves imparipinnate, leaflets in (2–)3–4 pairs, linear to lanceolate, ovate or elliptic, 2–10 × 0.5–4.5 cm long, entire or toothed. Flowers in terminal panicles, 5–13 cm long and some axillary cymes lower down, smaller than in previous species. Calyx cupular, 2–3 mm long, undulate. Corolla cream, streaked with dark purple or maroon especially on lower side, shortly infundibuliform, 1.5–2(–3.5) cm long, the lobes usually small and rounded, 2–5 × 2–4 mm. Fruit ellipsoid, (5–)9–12 × (1.7–)2.5–3 cm, rugose. Seeds 2.5–3 × 1.5–2 cm including wing. Native of Australia, New Guinea and Pacific Islands. Cultivated in Kenya: Nairobi, Dec. 1962, Beecher s.n. ; Nairobi, Karen, Hort. Merryweathers, 1 Jan. 1967, Gardner in EA 13685. 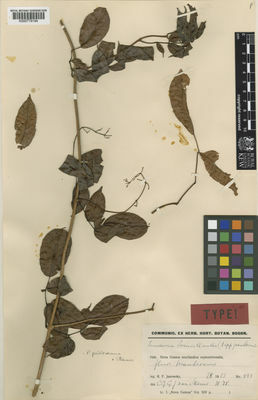 E. Afr. ed. 4 p. 141 (1957) as Tecoma australis R.Br. orPandorea australis (R.Br.) Spach).